The Fan-Thom II gives you everything that the Fan Thom does plus it comes with a threaded thermostat that screws into the engine block or manifold for a professional installation. 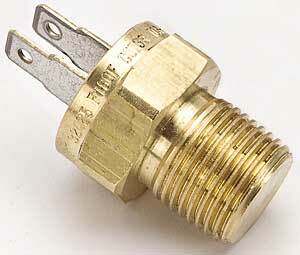 Thermostat thread size: 3/8''-18NPTF fitting. These Painless Electric Fan Relay Kits offer everything that the Weatherproof Electric Fan Relay Kit does while adding thermostat protection. Choose from either a 3-pack or 6-pack bank of 50 amp relays. Ideal for powering accessories such as fuel pumps, water pumps, throttle stops, fan, nitrous solemoids. 3-pack kit includes one 50 amp circuit breaker; 6-pack includes two.